Autism can be difficult for teachers to cope with in the classroom, but there are certainly methods to make autistic students more comfortable and productive. Amy Maplethorpe, a speech-language pathologist working at Raymond Ellis Elementary School in Round Lake, Illinois, was contending with a student and researched ways to help him. She came up with a design for a chair that offered a constant controlled sensory stimulation. 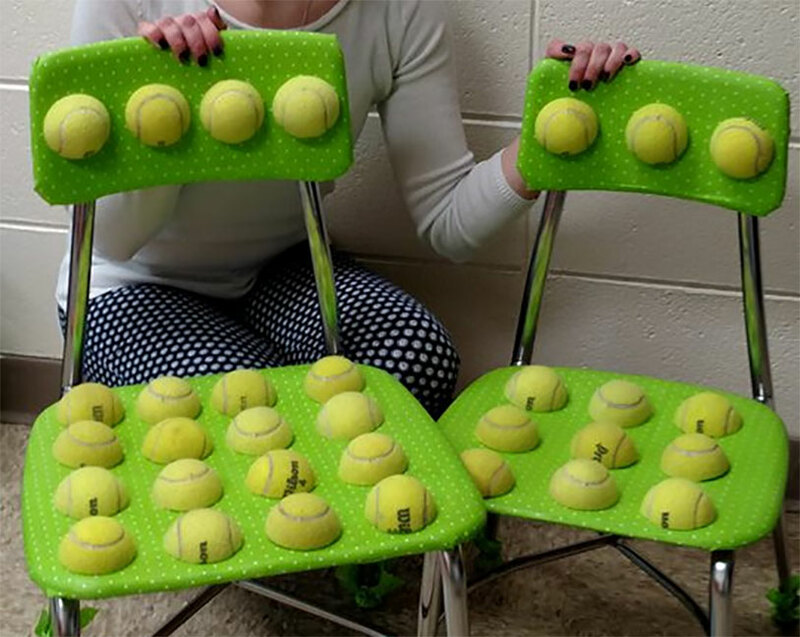 First she cut dozens of tennis balls in half, then using a hot glue gun she affixed the halves to a pair of chairs and desks. The newly nubbled surface gives the students a way to stimulate themselves without disrupting the class, allowing them to participate with increased focus. So far, they’ve proven wildly successful. She got the idea from Pinterest and hopes that other schools will employ the technique to aid their autistic students. It was a low-cost solution that worked. It’s increasingly difficult for schools to accommodate students with special needs, so anything they can do to help kids learn is appreciated. Learn more at MNN. The school has also posted instructions for making the chairs on their Facebook page.